Tamil Nadu is one of the 29th states of India and southernmost part of Indian Peninsula. It is bounded by the Eastern Ghats on the north, by the Nilgiri, the Anamalai Hills, and Kerala on the west, by the Bay of Bengal in the east, by the Gulf of Mannar and the Palk Strait on the southeast, and by the Indian Ocean on the south. Here, we are giving important information on Tamil Nadu for general awareness. 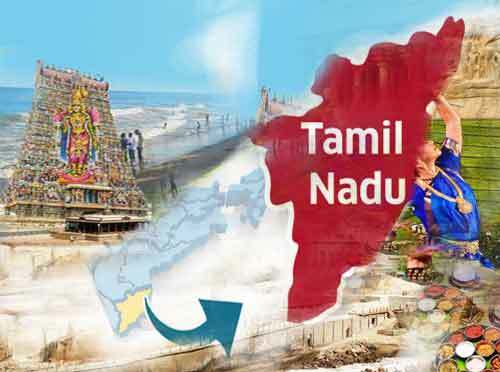 On 14 January, 1969 the state renamed as Tamil Nadu, 1956- Madras was bifurcated to create separate Andhra; on 15 August 1947, Madras Province with Andhra Pradesh came into being. South India had remained under the hegemony of the Cholas, the Cheras and the Pandyas for centuries. The Pallavas held supremacy from about the second quarter of the fourth century AD. They were the originators of the famous Dravidian style of temple architecture. The last Pallava ruler was Aparajita in whose reign the later Cholas under Vijayalaya and Aditya asserted themselves by about the 10th century. At the end of the 11th century, Tamil Nadu was ruled by several dynasties like the Chalukyas, Cholas and Pandyas. In the two centuries that followed, the imperial Cholas gained paramountcy over South India. During 14th century, the Vijayanagar Kingdom quickly consolidated itself and extended its sway over the whole of South India and at the close of the century; Vijayanagar became the supreme power in South. However, it crumbled at the battle of Talikota in 1564 to the confederate forces of the Deccan Sultans. The Portuguese, the Dutch, the French and the English came in quick succession and established trading centres known as ‘Factories’. East India Company which had established their factory at Masulipatnam, now in Andhra Pradesh, in 1611 gradually annexed territories by encouraging enmity among the native rulers. Tamil Nadu was one of the first of British settlements in India. The State is the successor to the old Madras Presidency which in 1901 covered the bulk of the southern peninsula. The composite Madras State was later reorganised and the present Tamil Nadu was formed.